Creamy Chive Sauce - Deliciously zingy and creamy sauce with chives and crème Fraiche. 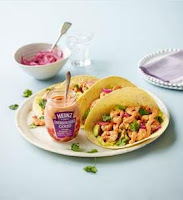 Ready to eat, it can also be used as a dip or add that extra something to summer classics such as salmon fillets or fish cakes.zingy and creamy with potatoes. 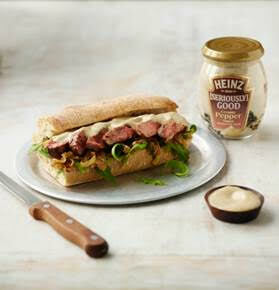 Creamy Pepper Sauce - A creamy and warming pepper sauce is perfect for a cheeky mid-week steak treat. For those who would prefer to avoid red meat, it is also delicious with chicken, giving a fresh and delicious twist to BBQs dishes. Creamy Béarnaise Sauce - Perfect with meats and fish, a french classic is made with chopped shallots and tarragon. Rich and buttery. 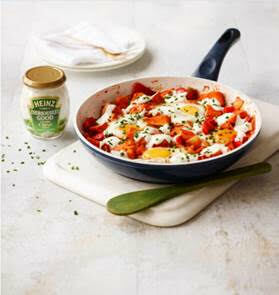 Creamy Tomato & Garlic Sauce - A rich and lively tomato and garlic sauce is perfect for chicken and grilled meat dishes. Available in Sainsbury’s and Morrisons with an RRP of £1.99, these great tasting condiments are the perfect way to add excitement and liven up everyday meals, I recently had Sausages and Mash with a helping of Heinz [Seriously] Good Creamy Chive Sauce, it was delicious and gave a family favourite a completely new taste. 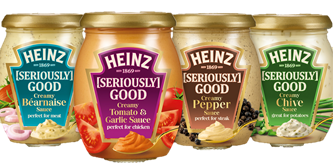 Here are some delicious recipe inspirations using Heinz [Seriously] Good Sauces. 1. Fill a large shallow pan with water and add 6 tarragon sprigs and half the lemon juice. Add a little salt and bring just to the boil, then slide in the salmon, turn the heat down to a gentle simmer and poach for 8-10 mins. Once cooked to your liking, remove from the pan, drain and leave to cool completely. Remove any skin. 2. Bring the water in the pan back to the boil, add the asparagus and blanch for 2 mins, then remove and cool under cold running water, drain well. 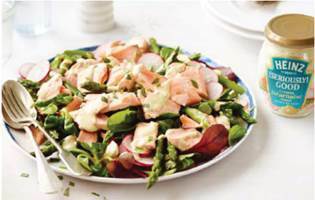 Arrange the asparagus with the baby leaves and radishes on a serving plate. Flake over the cooled salmon. Mix the remaining lemon juice with the Heinz [Seriously] Good Creamy Béarnaise Sauce to loosen it, then drizzle over the salad. Chop the leaves of the remaining tarragon sprigs and scatter over the salad. Heat the oil in a large frying pan. Add the potatoes and fry for 2 minutes, then pour in 100ml water. Cover with a lid, turn down the heat a little and cook for 5 minutes, shaking the pan to move the potatoes every so often. Turn the heat back up to high and add the onion and red pepper, fry for 1 minute, then pour in another 100ml water, cover, turn the heat down and cook for another 5 minutes, shaking the pan occasionally. Add the garlic, cayenne, and cumin and cook for 1 minute before stirring in the tomatoes. Cook together for 1-2 minutes, then make 4 holes in the mixture. Break an egg into each hole then cover the pan and cook over a medium heat for another 5 minutes, or until the eggs are cooked to your liking. serve, drizzle with the Heinz [Seriously] Good Chive Sauce and scatter over the snipped chives. First pickle the onion. In a bowl mix the lime juice, salt, sugar and olive oil, then stir in the sliced onion, turning it well in the mixture. Leave to pickle for at least 30 minutes. Toss the avocados with the juice of half the lime and cut the other half into wedges. Toss the king prawns with the jerk seasoning, plus salt and freshly ground black pepper. Heat the olive oil in a wok and stir-fry the prawns for 3-4 minutes until cooked through. Top the tortillas with the lettuce, pickled onions, avocado, and prawns. Spoon over the Heinz [Seriously] Good Tomato & Garlic Sauce, then top with a few coriander leaves. Serve immediately with lime wedges for squeezing over.